A unique, non-contact instrument for real-time motion and vibration measurement. The image dissector tube in the optical head converts the movement of the focused target into a fast-responding, non-scanned, calibrated analog signal, for a process that works even when other instruments fail. 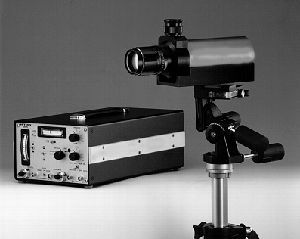 The non-contact, electro-optical Displacement Follower tracks the motion of a target that has a sharp discontinuity in light intensity, either reflected or emitted. The tracking system locks onto and follows the light-dark interface. The lens system focuses the image of this discontinuity onto the photo cathode of an image dissector tube (click for a simplified drawing of this tube). Electrons emitted from the backside of the photo cathode in proportional to the intensity of the projected light are then accelerated to refocus on an aperture plate containing a small hole. This converts the optical image to an electron image, with an electron density is proportional to the light intensity of the target. As electrons enter the small aperture, they are amplified to produce a current output proportional to the number of entering electrons. Moving the electron image across the aperture plate causes a change in the number of electrons entering the aperture. The system detects change in the output current of the phototube, and through a servo loop is able to cause the electron image to refocus on the aperture. The servo loop circuit re-enters the electron image by passing current through coils to create a magnetic field that deflects the electron beam to its original position. The current needed for deflection is directly proportional to the distance that the electron image has moved away from center and is therefore a measure of displacement. Since the aperture has a finite dimension, the actual interface (target) can be moved.